45" wide 23" deep 22" high 60" to top of the mirror I will help load when collected. Fabulous 1940's Oak fronted dressing table with 3 drawers in each pedestal and all in good working order, with a drawer in the middle. Solid Oak front and veneer side panels. The mirror tilts and can be taken off for transportation. This lot is a genuine Edwardian item of mahogany furniture. Antique Edwardian 4-Drawer Chest, Good Condition. An Antique Edwardian Mahogany Ladies dressing table.. sweet 5 drawer dressing table/ writing desk. L 90 CMS W48 CMS H76 CMS. 3 scratches on top as in photp. handles and drawer knobs original. My grandfather had this rather lovely bow-fronted mahogany chest of drawers made as a wedding present for him and his wife in around 1923 by a furniture maker in Bury, Lancashire. 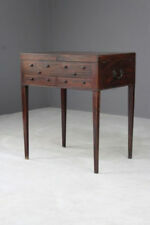 The top is solid wood, with a nice patina and the drawers have string inlay. The four casters are original. There are some scratches to the top, commensurate with age. Dimensions are: Width: 100cm, depth: 55cm; height to top: 100cm; height to back stand: 112cm All bow-fronted drawers average 40cm front to back and 83cm wide. Each is a different depth: 11cm, 13cm, 15cm, 17cm I’m also selling the matching dressing table. For collection only, from St Albans, Hertfordshire. Gorgeous antique inlaid mahogany Edwardian dressing table with a lovely shield shaped mirror. Antique Edwardian Dressing Table. Very good quality when new and still in great clean antique condition, all the drawers, mirror supports and the top are inlaid to the edges. Here we have for sale a Mid Century William Lawrence of Nottingham Dressing Table /Desk. I have only given the dressing table a single coat of danish oil to revive the beautiful darker toned teak and its already looking so much better for it. An elegant Art Deco dressing table with makers emblem by SHRAGER still attached and complete with original full length mirror, Hinged side doors, both contain built in drawers, larger sliding drawer beneath mirror, Mirror silvering is mostly very good and eminently useable, Mirror and supports can be easily removed for easier transportation. 166 Cm tall to top of mirror. 77.5 Cm tall. This is a beautiful dressing table we found this week in Compiegne, France. The oak veneer has lovely grain and a rich golden oak colour. Mirror glass is in very nice condition with just a little very minor spotting. The top has a few nicks in it around the edges but no cracks and is solid. (see pics 6-8). d x 30.5cm without top, 33cm with top. w x 61cm without top, 69cm with top. Bedroom Drawers With Mirror antique Victorian dressing table. Dimensions: Height 76 cm Total height 148 cm Width top 92 cm Depth 23 cm Pet free, smoke freehome Please see my other items Happy bidding! Cabinet height: 72cm (145cm with mirror). Width: 122cm. This really is a beautiful piece of furniture mid-century, walnut veneer. It has a very solid but elegant appearance with a stunning mirror above which has a working tilt function. A vanity / dressing table in teak with a wide mirror which stands slightly above the cabinet base part. sold as seen - there is a noticeable ring stain on the surface, this can be removed by stripping back the wood. A stylish retro teak chest of four drawers with a detachable mirror. Small coffee table - Blanket box - Nest of tables - Drinks trolley – Bicycle - Coat stand - Folding garden table & chairs - Small occasional table. Item Condition. 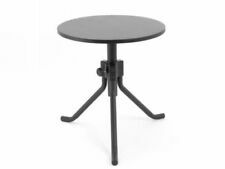 70cm High, 40.8cm Deep, 130cm Wide. We will not accept cash on collection. The mirror is detachable and will fit in a small car! Height: 112cm (incl mirror). Height: 66cm (excl mirror). Mirror: 43cm x 90cm. Alternatively you can arrange collection from Bournemouth. Depth: 45cm. Very pretty and elegant Edwardian dressing table. Bevelled oval mirror. 2 large lower drawers and 2 small jewellery storage drawers below the mirror. 91 cm wide x 51 cm deep 77 cm high to the top of the base 152 cm high inc the mirror. 1960/70s dressing table in very good condition. Looks like formica type covering. Collection only from a DA7 postcode. evenings after 6pm or weekends. Dressing table Mirror. Lightly used, vgc, I believe it has some age. G Plan Dressing Table With Mirror Ready For Upcycling. Collection in person only. OLD AND VERY HEAVY CHAIR, I THINK ITS OAK. CASH PREFERED. Believed to be 1940s Dressing Table, in well used condition. Suitable for upcycling or restoration. 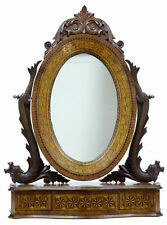 A rare and attractive piece, whose mirror is in great condition and holds position well. Historic knocks, marks, cracks, scratches, wear, imperfections, repairs and alterations, as is always the way and to be expected with genuine antique furniture. (Dove tail joints. Hard to photograph but bevelled mirror shows signs of scratching andage, but not foxed. Despite it's faults it's still a lovely item with many years usage left. Wheels missing from both front and back on the left hand side - seephotos ( books shown supporting/levelling can be included :) ). For sale is this lovely solid and sturdy mahogany dressing table chest. With Art Nouveau handles with heart shaped detail. Height to dressing table top - 80. Height to mirror top - 157 cms. ORIGINAL MID CENTURY DRESSING STOOL. No.B885 FROM THE "CHINESE WHITE" RANGE. BUT PRESENT. ICONIC RETRO PIECE. VERY STURDY AND STRONG. MINOR GENERAL SIGN OF AGE/USE. Mirror tilts. Bevelled glass in good clean condition. Woodwork is generally good, a few age relaed marks. One piece of wood missing near base of mirror stand (pic). An antique victorian small dressing table with carved cabriole legs three drawers and oval mirror sizes = 90 cm w x 43 d x 130 h x table top 66 h.
Standing on bracket feet this most attractive Oak Dressing Table rises to two pedestal, having two deep drawers either side a useful knee-hole space, and above there are two further drawers; all furnished with wooden knob handles. Antique Victorian Mahogany Duchess Mirrored Dressing Table. The dressing table has a lovely shape with shaped columns to the front. There is a single hidden drawer beneath the work surface. Above the back of the dressing table is an shaped bevel-edged mirror with carved supports. We think that this is Austinsuite but there are no makers marks. 120 overall height. Collection from Rugby CV22 Jn 18 M1 or Jn 1 M6. Ideal light refurb or upcycle. 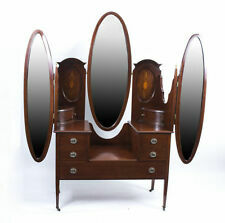 ART DECO C1960s Large Dressing Table And Mirror. Item is not chipped or damaged anywhere but will need painting. All solid wood no chip board. PLEASE NOTE ITS THE SIDEBOARD ONLY THE STOOL IS NOT INCLUDED thx. Collection from Lincoln please, the mirror comes off and so can the side drawer units for transportation. SIZES CLOSED 28” wide 20” deep and 32 1/2” high FULLY OPENED 56” wide. Get Free Quotes. Edwardian Satinwood ?. Dressing Chest/table 6 drawers. Very Cute Victorian Distressed Pine Dressing Table. Painted soft ivory. Measuring 76cm wide x 114 high x 42 deep Collect from GU5 outside Guildford. Timeless antique dressing tables are available in a wide variety of classic designs that date back through the fashion periods of yesteryear. Elegant dressing tables are perfect for bedroom display and everyday use. Antique dressing tables that boast a chic French Louis design range from single drawer vanity tables to curvaceous styles that show off elegant Queen Anne style legs, and a decorative bifold mirror. Vintage dressing tables that feature Art Deco design generally have an oversized vertical centre dressing table mirror , with folding side mirrors. The dressing table has a low drop centre, with a glass topped shelf that is flanked by two curved cabinets with authentic Bakelite handles. Mid century retro style designed tables that are made from golden oak often display authentic features like a tilted mirror, and pull out side drawers that curve outwards. Other styles also Victorian designs which are available in a wide selection of unusual and distinctive designs. Some dressing tables have intricately carved framed mirrors, with storage drawers and compartments arranged either side, and in the dressing table base. Other styles boast twin, full size mirrors that extend out to either side for the ultimate view whilst grooming. Art Nouveau dressing tables that are made from solid walnut usually have a smooth satin finish. The compact double drawer vanity table has a table top storage compartment and rectangular mirror. Carved embellishments add extra detail. Reproduction French Louis style designs will often feature elaborate marquetry detail. Some designs have intricately carved straight legs with ormolu inlay detail to the scalloped edge table, drawers and elegant curvaceous mirror. Antique dressing tables are an elegant, stylish and ultra feminine grooming option for any modern bedroom. Many styles of antique dressing tables boast a large selection of storage drawers, compartments and sections to easily store all of your make up and grooming essentials. Smaller size antique dressings tables are ideal for bijoux boudoirs. The Victorian or Art Nouveau dressing tables are perfectly proportioned to maximise restricted spaces. For the slightly larger more spacious bedroom, antique dressing tables create a great centrepiece feature. Choose from the many different styles, such as a chic mid century French designer dressing table, with glossy marble laminate and shiny gilt trim. 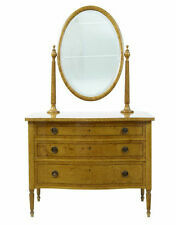 The antique dressing table has three drawers on each side, and a raised shelf, with fan shaped bevelled mirror.